Cannabis Cultivation is a new industry that is reliant upon state-of-the-art controlled environment rooms. Darwin Chambers designs and manufacturers Cannabis Curing Rooms that are capable of exactly replicating the drying process that is needed to maintain proper levels of cannabinoids and preventing mold and mildew. 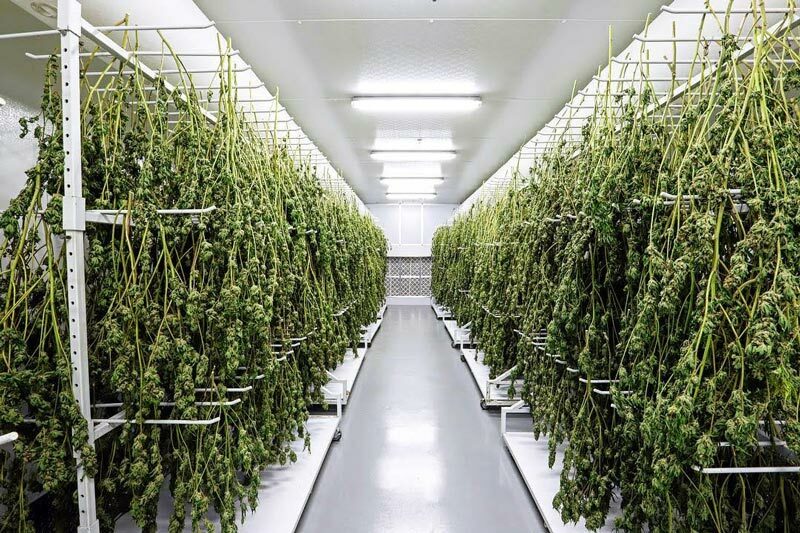 The Cannabis Drying Rooms manufactured and installed by Darwin Chambers in Pittsburg are built to meet the specific needs and requirements of every business, product, or specialty, and to do so without compromising any of the performance or reliability of the hardware. Darwin provides extensive levels of customization for its Cannabis Drying Rooms in Pittsburg which allows any room or build to be replicated with ease across multiple sites. The Cannabis Drying Rooms we create are also capable of storing and maintaining the quality of the product for extended periods of time to ensure the consistency and quality of the cannabis. Generally, it is recommended to keep the drying temperature between 16 and 21°C because many terpenoids (molecules that are partially responsible for the psychoactive effects but also largely responsible for the odor of the plant) evaporate at temperatures beyond 21°C. Non- programmed drying humidity levels should generally be between 45-55%. Higher humidity levels are associated with mold. Lower humidity levels tend to dry the products too quickly. If the plant material dries too quickly, some of the chlorophyll will fail to be converted which will result in a sub-optimal taste and a harsher smoke when combusted and inhaled. While some customers will follow the above guidelines, others will want to program increased drying at some times and/or more humidity toward the end of drying using the microprocessor’s programming features. Darwin Chambers utilizes a proprietary method of cooling, the PFTCU, (precision fluid temperature control unit) to precisely control temperature. Unlike typical refrigeration units, the PFTCU enables fast replacement (30 minutes) of all cooling components as well as redundancy when ordered as such. Exclusive Antimicrobial Coating on door handles to reduce the spread of bacteria and pathogens. Stable temperature preserves cannabinoids well. Low light levels are also important for proper drying of grown plants. Darwin Chambers offers options to control light levels along with many other chamber options including Black out strip curtains (to prevent unwanted light infiltration when people must enter the chamber), data loggers, chart recorders, shelving and curing racks. Quality – Darwin Chambers’s Engineers are factory-trained in the newest methods and procedures and use this knowledge to design, manufacture, and install every cannabis drying room that Darwin is entrusted with. Our Engineers have extensive knowledge of the needs and requirements of the fast-paced cannabis industry, and design and adapt our cannabis drying rooms in Pittsburg to meet the exact needs of any business or application. For our engineers, quality is not an option, but a standard. Every Cannabis Drying Room that we install is built to provide quality and reliability for years. Speed – We keep in stock an expansive selection of critical parts required to maintain, repair, or enhance any cannabis drying room in Pittsburg. We test and guarantee the proper working order of each part before shipping, this includes the full pre-charging and testing of any temperature control system. In the event that a larger order of parts is required, shipments can be consolidated to reduce costs. We have the capability to provide parts and other services as quickly as six weeks or less. Performance – Our team only uses and relies upon the most trusted and effective recent technologies available. This allows our engineers to design and produce cannabis drying rooms that are of the highest quality and reliability. We excel in the actual calculated electrical efficiency of each room using high-efficiency EC (Electrically Commutated) fan motors, high performance 4” polyurethane foamed-in-place panels, UV-disinfected ultrasonic humidification, and our unique PFTCU (Precision Fluid Temperature Control Unit). Our Cannabis Drying Rooms have consistently surpassed the humidity and temperature requirements required by the FDA/ICH/GMP guidelines. Price – The products and technologies that we use exceed performance requirements while also lowering cost projections. Our pricing structures will always be reasonable so that we can offer you a truly superior service. We are dedicated to providing the highest quality of performance, price, and reliability for every cannabis drying room we build in Pittsburg. The reputation of a business is made or lost upon the quality of the service it provides, that’s why our team of engineers always place the needs and requirements of your build first. Darwin Chambers is a leading provider of cannabis drying rooms in Pittsburg because of our ability to create cannabis drying rooms that meet the exact needs that our clients have. Below is an expansive list of the Features our cannabis drying rooms provide. Now is the time to take advantage of the emerging Cannabis industry. Our team and engineers realize this, that’s why we are offering our services to businesses that want to maximize their growth potential while also claiming critical markets in areas that have a need for cannabis application and products. If your business is in need of a reliable, high-performance cannabis drying room, or you would like suggestions or have further questions about our cannabis curing room procedures, methods, or recommendations, reach out to our team at your earliest convinience. We can be reached at 314-534-3111, 877-783-6774, or you can reach out to our team online through this link – HERE.